Elisa Rose is a singer songwriter who beckons listeners into her inner landscape with tenderness, warmth and a honey toned, sultry voice. 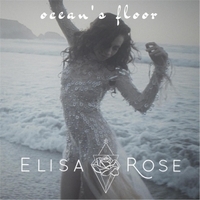 "I wrote “ocean’s floor” when I was 17 years old and falling deeply in love for the first time. It spoke to my experience of wanting to share all of myself with my beloved; to journey into the depths of intimacy with him. The lyric, “...the more that you love, the more that you must let go…” came to me when I contemplated the reality that our relationship would ceaselessly change and ultimately dissolve back into the great mystery. With the sincerity of my love for him came an understanding to continually let go of my expectations of him in order to see who he truly was." Elisa Rose is a singer songwriter who beckons listeners into her inner landscape with tenderness, warmth and a honey toned, sultry voice. Her signature sound follows in the path of her alternative lifestyle, traversing the worlds of folk, soul, devotional, ambient and electronic music. The resulting listening experience is one of immersion, where lyricism trail blazes through themes of love, lust and the spiritual journey and is backed by intricately designed lush instrumental arrangements. A multi-instrumentalist, Elisa utilizes acoustic guitar, keyboard and her voice to craft her sound. To record both her EP, Emergence, and her upcoming LP, Breath & Bones, she teamed up with producer and multi-instrumentalist Oliwa~. Together they forged a sound that is rich with vocal layers, acoustic instrumentation, synthesizers, organic textures and ambient beats. A student of many schools, Elisa’s upbringing and mentality have consistently registered outside the mainstream — from being raised by revolutionary parents on a commune in Ojai California to attaining status as a Kirtan Wallah and studying Indian classical music on the banks of the Ganges. A true lover of humanity and an avid seeker of self-knowledge, Elisa's music is imbued with messages of awakening and healing. She attributes the incantatory quality of her sound to her work with various plant medicine and shamanic traditions of the Americas. Her debut album, Breath & Bones, is due out in Winter of 2017 via independent release and will be preceded by the release of singles and music videos. The ten song album spans that last ten years of song-writing and is carried by Elisa’s voice, as she intimately reveals moments of great love, loss, growth and ecstasy.